Mark Saltzman began his career in New York with Jim Henson, writing for the Muppets. His Sesame Street sketches and songs (including Caribbean Amphibian) earned him seven Emmy Awards. But behind Kermits back, Mark was writing cabaret shows, screenplays and musicals. His musical play, THE TIN PAN ALLEY RAG opened at the Pasadena Playhouse in 1997 and was nominated for five Los Angeles Ovation Awards, including Best Musical. The show continued to play around the country and in June 2009, THE TIN PAN ALLEY RAG made its New York debut at the Roundabout Theatre Companys Laura Pels Theatre. Although there is no historic record of Irving Berlin and Scott Joplin ever having met, it's not unlikely that the legendary songwriters' paths might have crossed in that district of New York City known in the early part of the 20th century as Tin Pan Alley. R&H: Both Scott Joplin and Irving Berlin were called The King of Ragtime. What is it about their music that made them so popular? Mark Saltzman: Better question - what MAKES them so popular, still. The songs of Irving Berlin are very much alive and singing - "White Christmas" is still a popular -- maybe the most popular -- Christmas song. "Alexander's Ragtime Band" - a century old is still well-known. And Joplin's rags remain irresistible. The movies just don't get tired of using them. There was "The Entertainer" used as the title song in The Sting and I've even heard it on music boxes. More recently Joplin's "Bethena" was on the soundtrack of The Curious Case of Benjamin Button - the audiences went out humming the tune, even if they didn't know it was by Scott Joplin. R&H: Would you call the show a jukebox musical? Mark Saltzman: In the sense that the songs in the show are so well-known to the audience, maybe this could be termed a jukebox musical. Is that what jukebox musical means? But then, this show is set before the era of juke boxes. I'd say "Tin Pan Alley Rag" is more of a musical biography - like Walk the Line or Ray. But this is more the biography of two famous musicians - a musical biography for four hands. R&H: In THE TIN PAN ALLEY RAG, both Irving Berlin and Scott Joplin face a conflict of when art meets commerce. Can you talk a little about their struggle? Mark Saltzman: Berlin limited himself to writing for the commercial world, to Tin Pan Alley, the name for the pop music industry of that era. He did exceptionally wonderful work in that field, but he was self-limited. Joplin wanted to conquer all worlds of music - piano rags, opera - but he was societally limited. He was an African-American in a very restrictive white-dominated society. But within those limitations, it's miraculous how much he accomplished. R&H: THE TIN PAN ALLEY RAG is a blend of historic re-imagining and fiction. As a writer, how much of yourself do you bring to the characters of Berlin and Joplin? Mark Saltzman: I could relate to both of them. I'm closer to Scott Joplin in age, and I've had successes and disappointments in my artistic pursuits. But I relate to Irving Berlin ethnically -- even ethno geographically. Is that a word? My father, like Irving, was Lower East Side Jewish, and I was raised in New York. But I don't find myself as interesting as either of these guys. 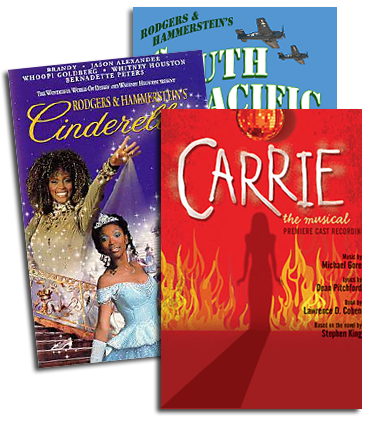 R&H: Youve changed a bit of the show since it first premiered in 1997, and some of these alterations have been added to the R&H Theatricals licensed script. Can you tell us a bit about this process and the changes? Mark Saltzman: The music I selected for the show hasnt changed very much and the Berlin and Joplin music is really the essence of the show. But in the course of several productions, more and more weight was given to the roles of the two wives, Dorothy Berlin and Freddie Joplin. R&H: Do you have any advice for customers performing THE TIN PAN ALLEY RAG? Mark Saltzman: It should be performed as a play - this is an encounter between two early Twentieth Century musical geniuses and this all happens in a single night, with flashbacks to early parts of their life. Also, we've done the show successfully with nine actors. If a theater group is lucky enough to use more actors, my advice would be to use less doubling and tripling of roles. What are your favorite songs by Joplin and Berlin? Mark Saltzman: Well, that can change by the hour - and with my mood! But I think "Alexander's Ragtime Band" is terrific because of how fresh it sounds after kicking around a century. And I'm always moved by the simplicity of Berlin's "What'll I Do?" Joplin's rags are equally indestructible. I loved discovering music of his I didn't know - like the score of his ragtime opera, "Treemonisha." The finale of that work, "A Real Slow Drag" is certainly among my favorites. R&H: In addition to writing about two composers, youve composed music and lyrics yourself. Do you have a favorite song that youve written? Mark Saltzman: There's one that I wrote for Sesame Street that's given me a lot of joy - "Caribbean Amphibian." Not just the joy of hearing Kermit the Frog sing a song I wrote - but it's great knowing how many people learned that as a kid and still remember it. R&H: During the musical, Joplin asks Berlin What do you play for yourself in the dark? What are you working on? Mark Saltzman: There's always another musical to be written! I never stop feeling lucky that I get to work in this world of musical theater.